I wonder if I could make an electric bass. If something is easy to repair, it is easy to construct. In 1933 Fender met Esther Klosky and they were married in 1934. Players also needed faster necks and better intonation to play what the country players called "take-off lead guitar. " Soon musicians and band leaders began coming to him for PA systems which he built rented and sold. The guitars bass guitars and amplifiers he designed from the 1940s on are still relevant: the Fender Telecaster (1950) was the first mass-produced electric guitar; the Fender Stratocaster (1954) is among the world's most iconic electric guitars; the Fender Precision Bass (1951) set the standard for electric bass guitars; and the Fender Bassman amplifier popular enough in its own right became the basis for later amplifiers (notably by Marshall and Mesa Boogie) that dominated rock and roll music. He was inducted into the Rock and Roll Hall of Fame in 1992. 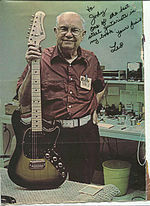 He left the company in the late 1960s and later founded two other musical instrument companies Music Man and G&L Musical Instruments.